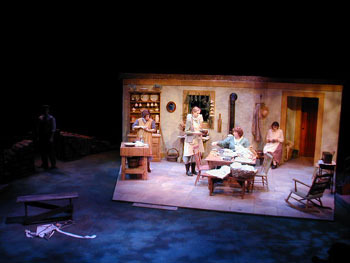 As you can see in the photos, Todd Dicken's set design for Dancing at Lughnasa was a unit set, portraying both the inside and outside of the house simultaneously. It was, therefore, important to differentiate between the indoor and outdoor scenes with other technical elements. I had several discussions with lighting designer Matt Filmek about how this could be accomplished. Between the two of us, I believe that the feel in the room changed subtly yet dramatically to fit the location of the action. For my part, I used four different recordings of "English Birds" from the BBC sound effects collection. I played them back simultaneously through four stereo speaker pairs located behind the arena style seating (see the system drawings). 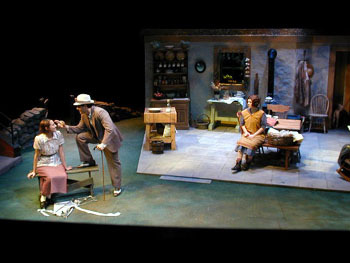 The four different stereo locations of similar yet unique country ambiances opened up the intimate space. Unfortunately, the audio sample here is but a poor stereo simulation of this effect, but I'm sure you'll get the point.